Tori's Pretty Things: Tori's Pretty Style & Beauty - "They call me Mellow Yellow"
Tori's Pretty Style & Beauty - "They call me Mellow Yellow"
Okay. Do you ever go shopping and a bright, beautiful blouse catches your eye? It calls your name and says, "You know how pretty I am. Pick up that hanger. Why don't you just try me on?" Then logic taps you on the shoulder and says, "Oh come on. You're never going to wear that! Why even bother?" Well, for me, usually that logical tap on the shoulder never happens, and that's how I end up with a closet full of bright colored clothes like this. I'm not complaining, though. Even as I grow older, a bright wardrobe just still make me so happy! I mean, okay. Clothes should first and foremost be a form of protection from the elements. But if you're blessed to have the means to fill your closet (count every blessing!) , then you should fill it with nothing but pieces that you absolutely love, right?! So add a check for this yellow blouse in my "absolutely love" column :). Plus, here's the best part. A great bold blouse is way easier to wear and style than you think. Since that blouse will immediately be the star of the show, you really don't need much else to look pulled together. Here I added simple ripped skinnes, brown booties, a couple bracelets and my staple pearl earrings. I looked polished and casual for a recent brunch without putting a crazy amount of effort in. Woot and woot! Also, can we just take a minute and enjoy how much Toronto is blooming?! 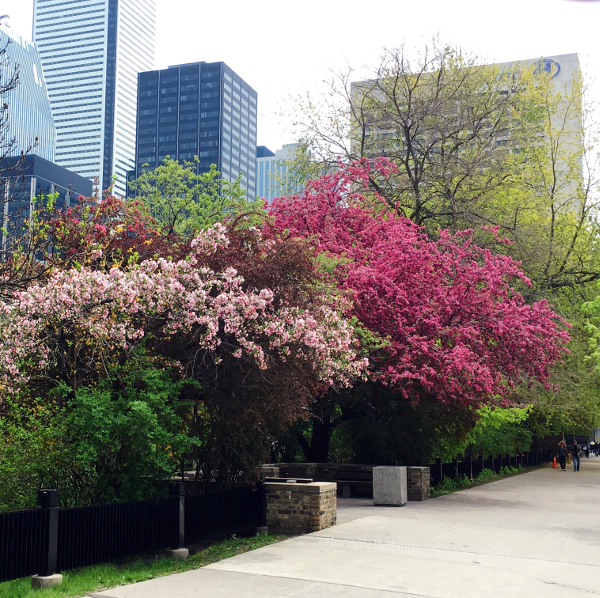 These beautiful blush and magenta trees are popping up all over the city. I love just taking a moment to stop and take them in before summer flows into full swing. Inspired by said trees, and to pair with my bright yellow blouse, I decided to keeep my makeup simple. The key to this kind of no-makeup makeup look is to spend a few extra minutes to even out you skin for that easy, glowing effect. I believe Michelle Phan once said that you have to think of your skin as your canvas. The better your canvas looks, the less you need elsewhere! So here I stuck with my all-time favorite everyday foundation and concealer combo to really even out my skin. 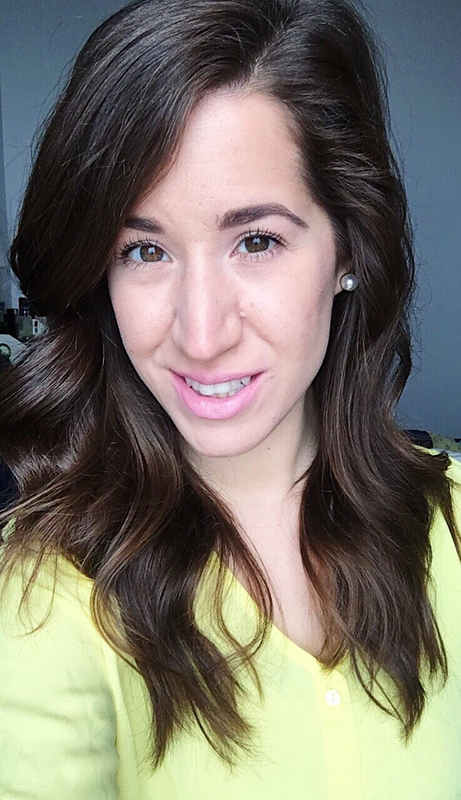 A luminous blush added a healthy glow, while filled-in brows and some mascara helped frame my eyes. I finished the look by taking that pink-tree inspiration and adding a pale pink lipstick. Now I'd love to turn the floor over to you. 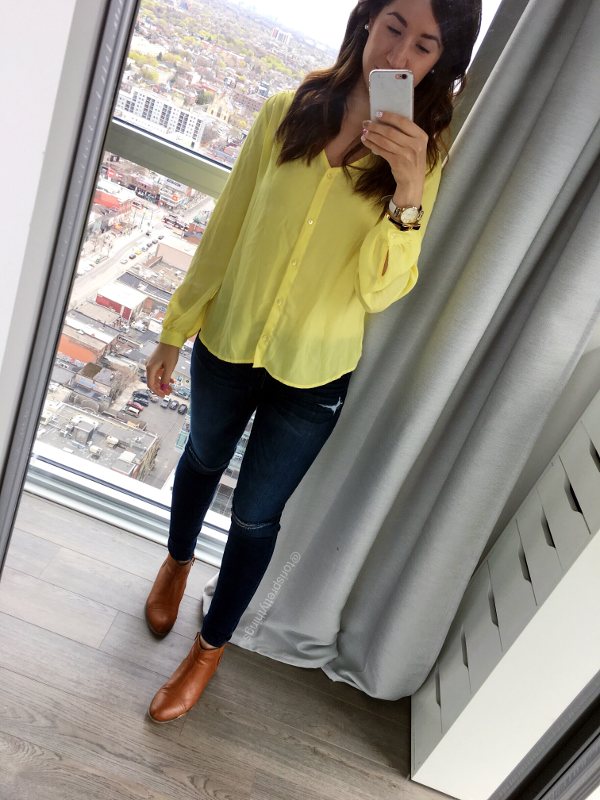 How do you feel about bright colored blouses? 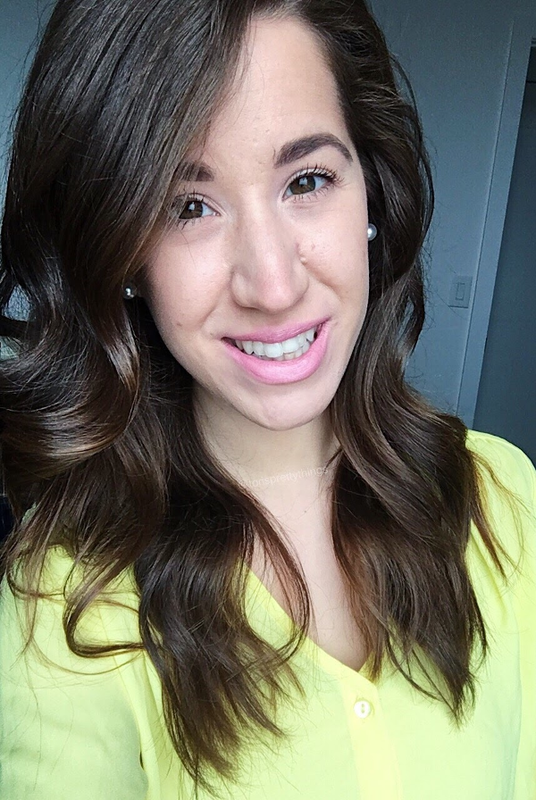 Do you have any great no-makeup makeup tips that I missed?